Gorge walking in the Peak District is exhilarating fun, perfect for the whole family or your hen and stag do. Test your nerves as we jump in natural pools and scramble up waterfalls. Experience the ultimate adventure activity in the Peak District, while taking in the spectacular scenery of the Dark Peak. Just 30 minutes from Sheffield. 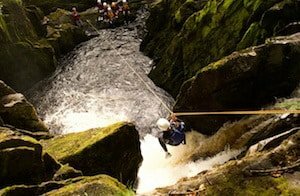 Continue reading about gorge walking in the Peak District. Explore an ancient gorge, carved out over millions of years in the heart of Yorkshire. The spectacular limestone gorge spans almost 1km long and features a huge jump, giant rock chutes and an epic waterfall climb. Located in Nidderdale, a few miles from Pateley Bridge. 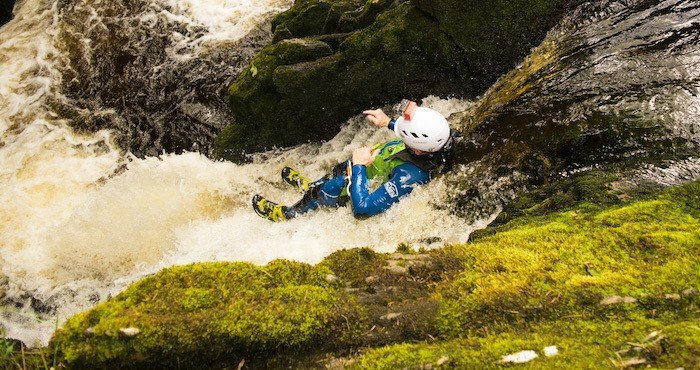 Continue reading about canyoning and Ghyll Scrambling in Eastern Yorkshire. The ultimate canyoning adventure! Combining the biggest jumps and chutes with abseils and a zipline, this is as thrilling as adventure gets! Located in the heart of the Yorkshire Dales, just a short drive from Ingleton.  Continue reading about canyoning and Ghyll Scrambling in Western Yorkshire. 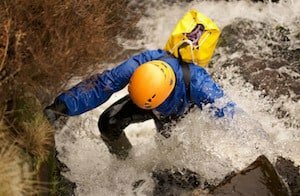 What’s the Difference between Gorge Scrambling, Canyoning and Ghyll Walking? 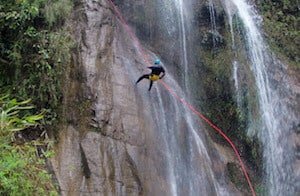 Generally, if we were to go on a canyoning trip then you could expect the use of ropes and some steep climbing or abseiling to gain access to or exit the canyon. A typical ghyll scramble or gorge walk involves scrambling up a river with some steep climbs, rocks to slide down and natural pools to swim and jump in – all while splashing around with a great group of friends in a stunning location. 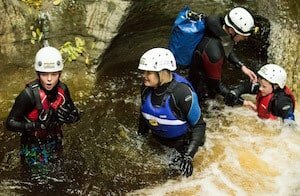 All of our canyoning, ghyll scrambling and gorge walking trips are suitable for almost all ages and abilities. Join us on one of our day trips across Yorkshire, the Peak District or for an epic adventure, the Nepalese Himalaya!